G’day, forex mates! The Aussie might have already seen some action this week, but the Australian Bureau of Statistics’ (ABS) release of jobs numbers tomorrow (October 20, 12:30 am GMT) could give another crack at volatility for Aussie traders! 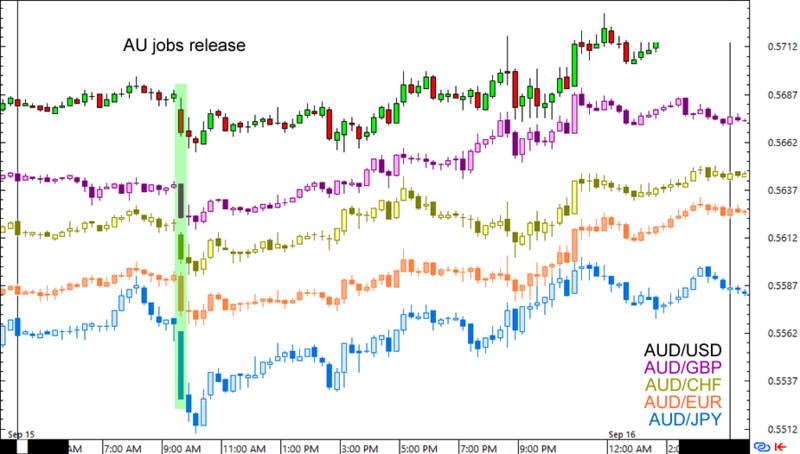 If you love volatility like most of the FX-Men do, then get up to speed with this forex preview! Australia’s unemployment rate fell from 5.7% to 5.6%, a low not seen since July 2013. However, a net of 3,900 workers had also lost jobs for the month when analysts had been expecting an increase of 15,200 jobs. What’s up with that?! Details reveal that a net of 11,500 workers found full-time work, which, unfortunately, wasn’t enough to offset the 15,400 decline in part-time jobs. Still, full-time job gains are preferable to increases in part-time work, as the former represents more steady income for consumers. Just as the Aussie bulls geared up for a celebration, they took another look at the participation rate. See, the labor force participation rate slipped from 64.9% to 64.7%, suggesting that the drop in unemployment rate is likely die to job-seekers getting discouraged rather than more workers getting employed. It also didn’t help that seasonally adjusted working hours also dipped during the month. Forex traders initially sold the Australian dollar across the board but the bearish attacks didn’t last long. Thanks to the mixed picture of the report and a risk-friendly environment in the next trading sessions, the Aussie was able to recoup all of its intraday losses by the end of the day. It looks like market players are expecting last month’s estimates to hold up this month. But what do the leading indicators say? National Australia Bank’s (NAB) survey of 500+ firms point to a pickup in hiring, as increases in sales, profits, and forward orders helped hold the index reading steady at +6 after two months of upticks. AIG’s indices also point to a pretty solid employment growth in September. The performance of manufacturing index (PMI) popped up by 2.9 points to 49.8 thanks to 5 out of 8 sub-sectors showing expansion. The employment component also increased by 2.1 points but remained in contractionary territory at 46.7. Services activity also picked up with AIG’s Performance of Services Index (PSI) rising by 3.9 points to 48.9 and its employment component ticking 0.8 points higher to 44.3. Even the construction sector showed improvement with its 4.8-point increase to 51.4. More importantly, its employment component was the biggest gainer with a full 10-point uptick to 57.6. The only party pooper was ANZ’s job ads data, which suggests that job postings declined by 0.3% in September after rising by 1.7% in August. Overall the leading indicators seem to point to a stronger job growth in September. Though most PMIs remain in contraction levels, they’ve shown improvements from the previous month. With a pretty tall order for net job gains though, it’s likely that the actual reading will disappoint like the last three September releases. 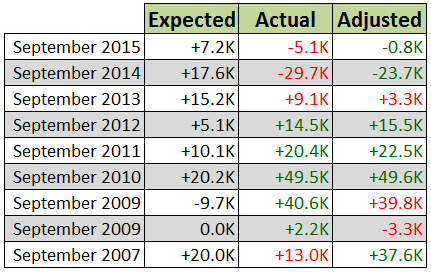 However, it’s also likely that they’ll be bumped higher after seasonal adjustments. As we’ve seen in the last few months, the Aussie has a straightforward reaction to the jobs release. That is, upside surprises tend to push it higher while worse-than-expected numbers tend to drag it down…at least for the next hour or so. Aussie traders usually take profits before the next session starts, so keep an eye out for possible intraday reversals when you trade the report!